One dark elf. Two enchanted blades. One unknown enemy. And a horde of invaders. 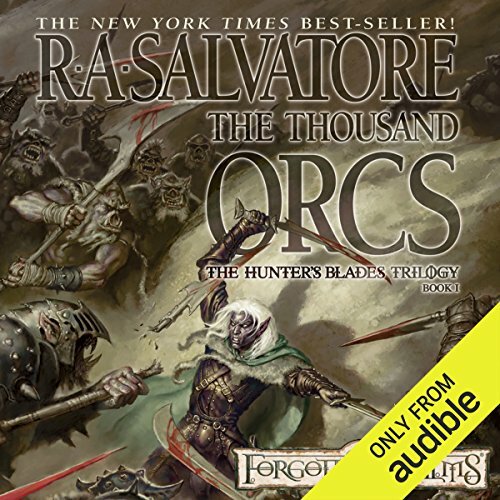 ©2003 Wizards of the Coast, Inc. (P)2014 Audible, Inc.
What did you love best about The Thousand Orcs? Quickly paced and moves right along, pulling the listener by the ear. I'd never read nor listened to RA Savatore's works before but now I have a pile of stories to get acquainted with all these wonderful characters. References to past events do not muddle the story line and are used to flesh out the intertwined development of the characters and plot. I do recommend this series. I'm getting the rest of this trilogy today! The story is interesting as are all of the Drizzt stories but whoever engineered/produced/edited it never listened to it in a car. The narrator talks too quietly in between voicing a characters. I find myself constantly playing with the volume to hear the narration then turning it down when the character's voice blares out their lines. This is not to bad mouth the performance. I'm sure it was worthwhile, what I could hear of it. Was The Thousand Orcs worth the listening time? I recently picked up a book by R. A. Salvatore after years of not reading it. I read the Sundering book one and decided to go back to learn what happened to set the stage for that series. Here we find the trio joined by an old friend to see the Bruenor off to be king of Mithral Hall. With many surprises along the way and a tower being dropped on someone’s head this story sets the stage for the rest of series. This story is really intricate while leaving a lot of openings for follow on stories. The second book I've read by this author and I love it he's a damn good author. Love the orcs wizards elf's and all races a magnificent tale of war and loss. when will they make this series into a holly wood blockbuster? it is way past due. This trilogy is the one that reminds me the more of Tolkien`s The hobbit ,i really like the great battles and fortresses.There are a lot of new interesting characters and brave dwarves,the narrator did a great job.My favorite trilogy after Homeland,exile and sojourn! (montolio was a great character). At last in audiobook,thanks audible. I read "The Lone Drow" first, by accident, and then went back to read "The Thousand Orcs." But I found that I had the gist of the important events inferred or outright retold in "The Lone Drow." 2) the antics of Pikel Bouldershoulder wiggling his fingers, giggling, and surprising elves with a High-Priest-level of druidry. Another fine book from R.A. Salvatore! I never tire from any books written with this character! The Narator is really getting on my nerves!! !